Rally and march in NYC on Sept. 17 at 5pm. 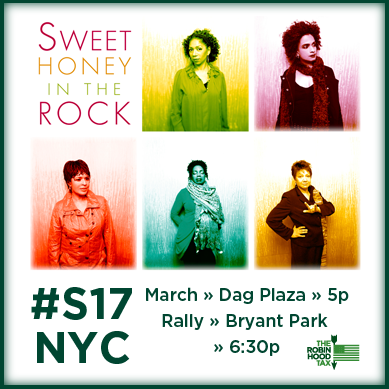 Performance by Sweet Honey In The Rock®, a performance ensemble rooted in African American history and culture. On the eve of Occupy Wall Street's 2nd anniversary, New York youth face increasing student debt and unemployment; public hospitals are shutting down, leaving patients in jeopardy; people living with HIV/AIDS are losing housing services; and NYC transit riders are suffering crippling MTA service cuts and route closures. NYC is losing its heart. All in the name of austerity-induced budget cuts. On September 17 the UN General Assembly will convene to discuss agreed upon international anti-poverty and public health goals to be achieved by 2015. None of the goals will be met without a total reversal of global austerity measures. Against the backdrop of the UN and the OWS anniversary, labor and community activists will rally to demand an end to austerity and full funding of human needs — locally and globally. The answer to how we pay for it all? The Robin Hood Tax. A tiny tax on Wall Street and its counterparts around the world is the antidote to needless suffering caused by austerity.